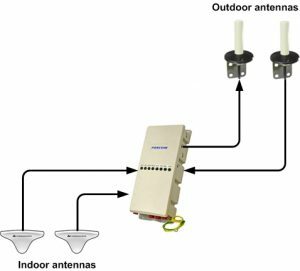 Iridium repeater kits provide mobile satellite communications in any indoor space where signal is not normally present. Iridium repeater kits come with all the parts needed for a successful installation apart from the optical fibre. The outdoor unit (ODU) and indoor unit (IDU) can be connected to existing optical patch panels or new optical fibres can be installed especially for the job. Optical fibre is available from some suppliers with pre-installed connectors – FalTech can advise and source fibre for you, or put you in touch with an experienced optical fibre vendor. More indoor antennas can be added by installing signal splitters and coaxial cables. For situations where physical separation of >3Km is not required. Outdoor unit (ODU) and indoor unit (IDU) now combined into one enclosure with no optical fibre interfaces. Up to 5,000 ft2 of hangar space can be covered by a single system with a ceiling height of 130 ft.
Fibre length: 3Km max (2dB). Iridium Communications Inc. is a Virginia, USA-based company that provides a truly global voice and data communications service via the world’s largest commercial satellite constellation. The Iridium network provides high-quality voice and data connections over the entire surface of the planet – across continents, oceans, airways and even the polar regions. The constellation consists of 66 cross-linked, low-Earth orbit (LEO) satellites (plus six in-orbit spares), operating as a fully-meshed network. This comprehensive coverage footprint provides a highly dependable, critical communication lifeline to a wide variety of users the world over. The graphic illustrates how the 66 satellites achieve global coverage, at a height of approximately 483 miles above the Earth’s surface. There are 11 satellites in each of 6 orbital planes, with orbits roughly “crisscrossing” above the north and south poles. Satellites are travelling at 17,000 miles per hour, completing an orbit of the Earth in about 100 minutes. The time taken to cross the sky from horizon to horizon is approximately 10 minutes. Each fast-moving satellite communicates with adjacent satellites in front, behind and alongside its own orbit. Each satellite can project 48 spot beams on to the Earth’s surface; the size of each spot beam is approximately 250 miles in diameter. The satellite’s 48-beam footprint is around 2,800 miles in diameter. All spot beams and satellite footprints overlap, which is ultimately what provides the seamless global coverage. However, use of Iridium devices indoors is very difficult, if not impossible, without sky-view. This is where an Iridium repeater kit plays a very important role in a number of different applications. 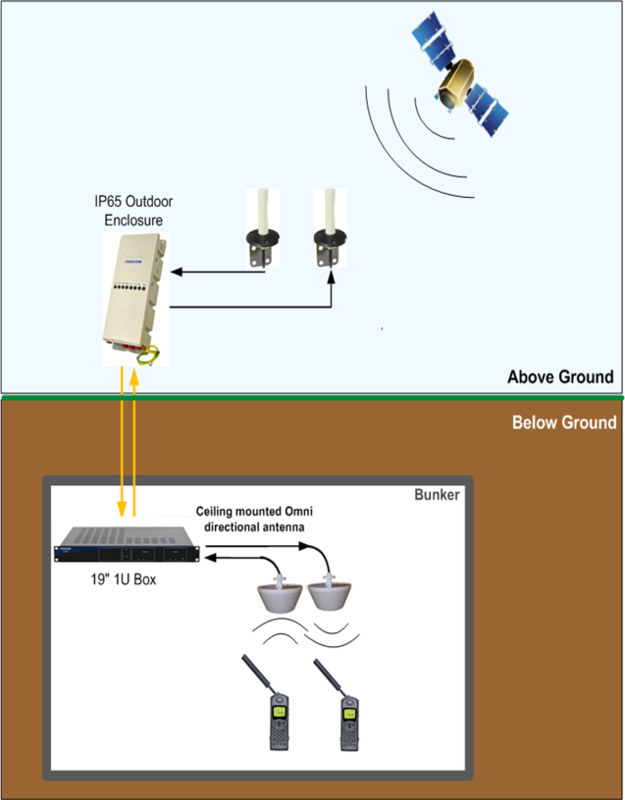 Iridium repeaters enable transmission of Iridium and GPS signals from outdoor to indoor. This video explains the installation process for Iridium and GPS optical repeaters and the basic functionality of the system.